This was really good, that is all. It doesn’t sound like much but it is much more than the sum of its parts, enjoy! Preheat your oven to 450 degrees and put the squash, chopped peppers and onions with spinach into a roasting pan, pour in about a cup of chicken broth and put in 1/2 the garlic and basil. Roast in oven for about 30 minutes or until the squash is tender. In a skillet cook the chicken breast in broth, garlic and basil until done. Serve over mixed greens and top with sun dried tomato dressing. Pour the chicken broth into a pan and put the chopped kielbasa in, letting it brown. After it browns add in the peppers, onions, basil and garlic, cook until peppers are tender but still crisp. 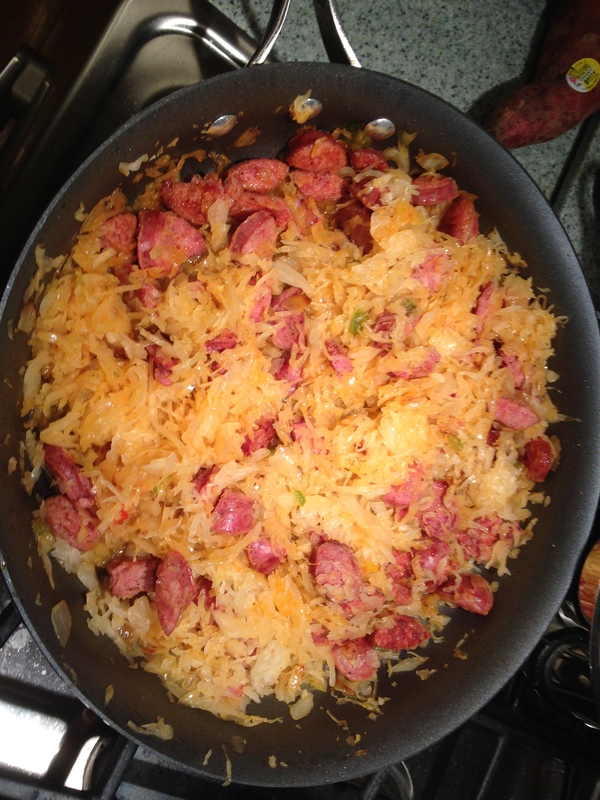 Once that is cooked up add in the mostly drained sauerkraut which you will only need to really warm. 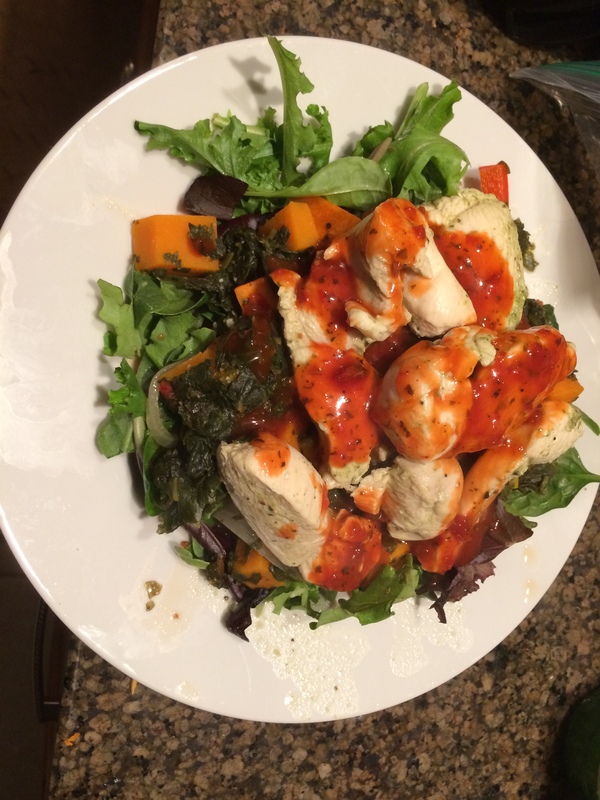 Serve over spinach or mixed greens to add some more nutrition. Enjoy! 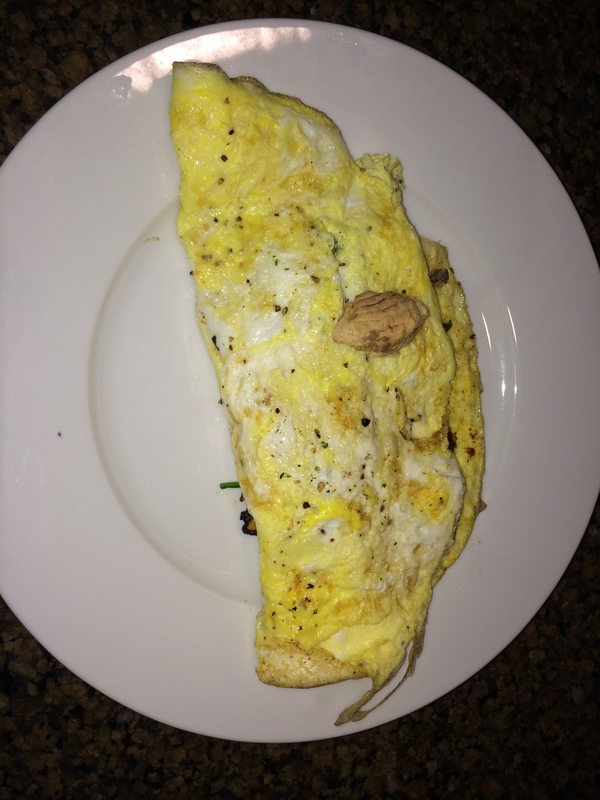 I don’t know what the love affair with eggs that all the cool Paleo people have is all about but they’re pretty tasty. I’ve cooked eggs in just about every way imaginable but some mornings there’s just nothing like some simple fried eggs except when you add tomatoes! I first did this over an open wood fire and it was exceptional but I was lazy this morning and wasn’t cooking anything else so I didn’t want to go starting a fire just for a few eggs and a couple tomatoes so I did this one over the stove, still good though. Enjoy! Fry the eggs to your liking (I prefer over medium) in the melted coconut oil and season to taste, flip once. Once they’re flipped drop two slices of tomato in the skillet and get them nice and warm, seasoning to taste. 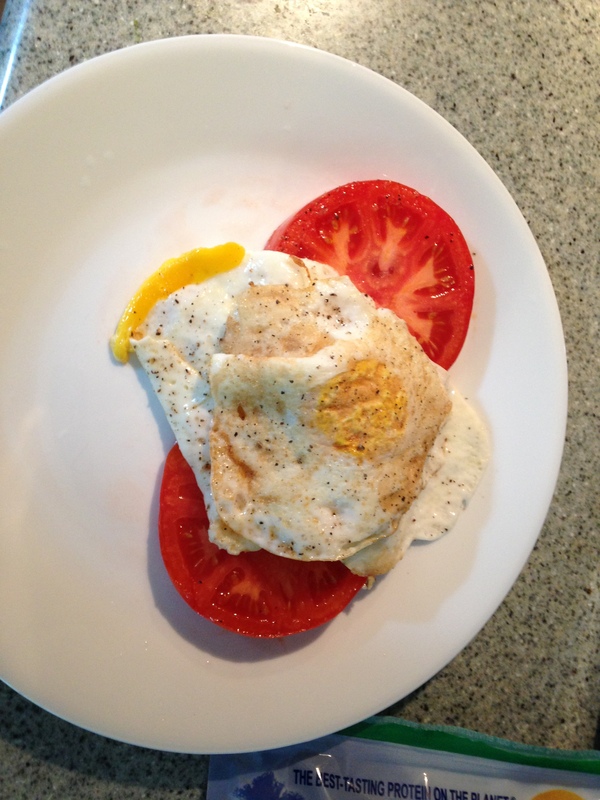 Serve eggs over tomatoes. Couldn’t be simpler. I have seen SOOOOOOOO many variations of this, most just tuna salad with avocado cups or crab salad in the same but you know what? Basically tossing in some mayo and onions for variety. However I’m a rebel, so I decided, “why not BOTH?! ?” I know, totally living on the edge. Anyway, sometimes I like to have lunch and even more times I like to have tuna with my lunch and some days I even like a warm lunch so this is a win. Pretty much every step of this can be omitted or altered so have fun with it. Enjoy! Sautee the onions and peppers in the coconut oil until they’re tender but still crispy, toss in the tuna and crab meat just to warm them up a bit. In a mixing bowl spoon out the innards of the avocados, leaving the shells intact (I popped the shells in a toaster oven for a few minutes to warm them up) and add in the mayo, garlic powder, salt & pepper to taste. Once the tuna/crap/onion/pepper mix is ready add it into the bowl as well. Mix it all together, now here is where we might have a philosophical disagreement. Some people like to really mash up the avocados but I like to leave it a little chunky, again, I’m a rebel, do what you like. 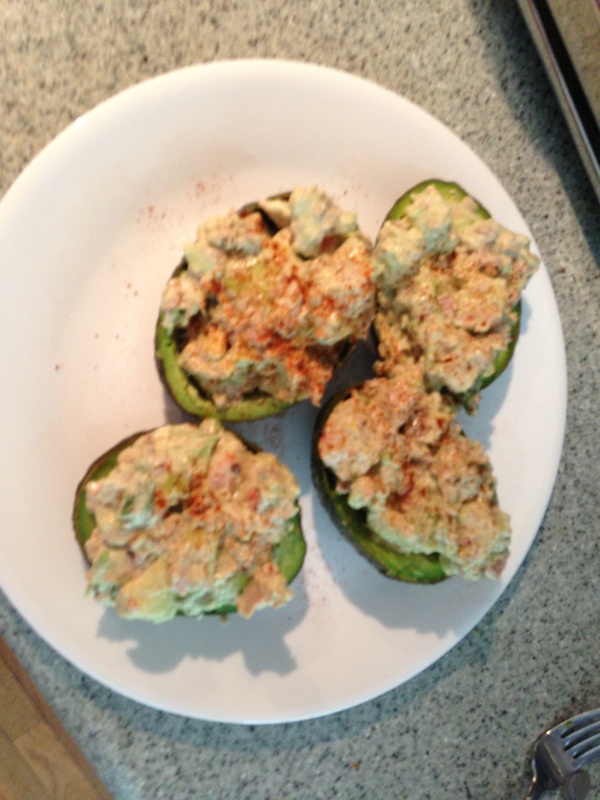 Anyway, once mixed to your liking scoop heaping spoonfuls into the, now toasted, avocado shells, top with paprika and enjoy. In case you’re wondering, yes, I had a lot of fun with this recipe. 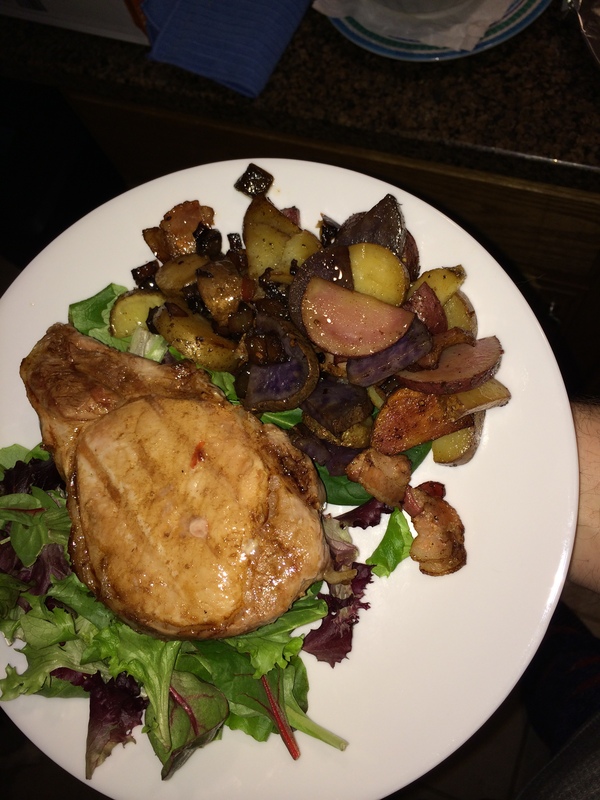 Dinner this evening was very good and easy. Enjoy. When you’re buying kielbasa, or any kind of sausage really, try to know where the sausage comes from, buy local whenever possible. I’m not sure there are any real health benefits to buying stuff locally (though I’m sure some would argue) but it does make good common sense especially with stuff like sausage. There is just something about being able to point to a map and say “I’ve been there” when you’re eating, I dunno what it is. Anyway, I live in Ohio and lucky for us we are rich in sausage making ethnicities so finding great local sausages is usually pretty easy. 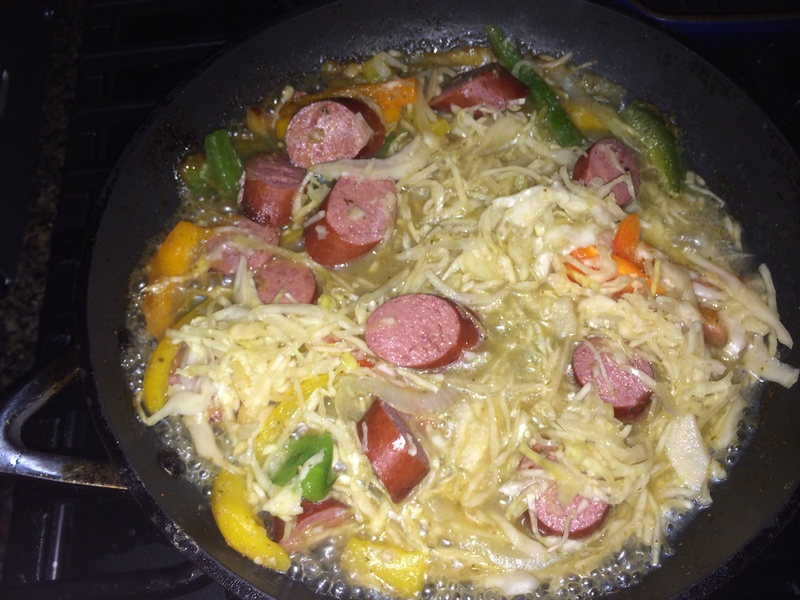 The kielbasa I used in this dish was local and delicious, I hate sounding cliched but you could almost “taste” the freshness. Anyway…. Cut up the 1/2 lb or so of kielbasa and start browning it in coconut oil. Once it is browned add in the tri-color peppers and onions and garlic powder. Once the onions and peppers are cooked down add in the sauerkraut and cook until the sauerkraut is done which should take less than five minutes or so. That’s it.